A couple of weeks ago, we launched SmartJourney. 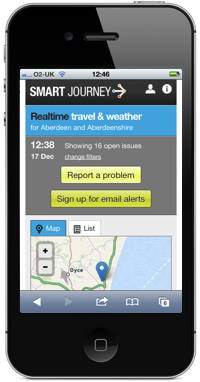 Built in collaboration with Aberdeen City and Aberdeenshire Councils, and part-funded by Nesta, SmartJourney combines crowd-sourced and official information and weather and travel conditions in the North-East of Scotland. Anyone can view existing issues, and report new ones through the mobile-focused web interface. By signing up for a free account, users can additionally subscribe to email alerts for updates to issues they’ve reported, or for issues reported in their chosen geographic zones of interest. For us, one of the most interesting aspects of this project is that all data generated by users of the site (except for the personal details of users, of course) is published in realtime as fully queryable and browsable Linked Open Data at data.smartjourney.co.uk. For convenience, we’ve also provided a RESTful JSON API for reading and writing issue-reports. Another outcome of this project was that we built a Ruby ORM for working with RDF data in a Ruby on Rails app, that we call Tripod. Tripod is by no means finished, and we’ll be adding more features soon (more details in another blog post). In fact, this is the first of many open source PublishMyData components that we’ll be releasing over the next few months.